Bear with me guys...I'm in the process of changing my blog look. I've been sitting here all morning just playing and it's not quite complete yet. I'm learning a lot by trial and error. The new header is a photograph my son took and I think it's perfect for me since I love vintage, I am a writer and hey, my son took this photo -- need I say more? Oh, and I finally have a button (to the right after my etsy shops). Speaking of which, I also changed the banner for my etsy shop Country Tag Sale. Go take a look. tell me what you think ... Tomorrow you may see something different. I've been having fun creating little trinket boxes for sale in my shop and for the upcoming craft fair. I've also had a few custom requests. And, I love custom requests! When I create something as a gift for someone, I really get to pour my heart and soul into the project. For example, I recently had a request from a mom in Texas to create a jewelry box for her daughter. I made one for the other daughter earlier this summer, and I can't wait to personalize this next one for the older daughter (I'll show you a before and after in a future post). I also hand painted and embellished a 16th birthday present for my friend's daughter -- makes it really special when you actually know the person! Here are the two I made for her (below). I let her mom select her favorite. As you can see, they are completely different styles. Since she's a dancer, her mom opted for the larger, more dance-oriented box. This one was painted a pale pink and distressed by rubbing a black glaze medium along the sides. I then used rubber stamps to create the top designs and highlighted them with this cool opalescent water color ink that I bought at a garage sale. I added Swarovski crystals to the ballet shoes to match the vintage jewelry piece I used for the knob. So much fun! The other design is a little less dance-oriented (except for the quote). On this one I tried some different materials to create basically the same distressed look. I used white gesso to paint it and then rubbed "Shabby Shutters" distressed ink from Tim Holtz along the sides ... I liked the effect! Then I added some Prima flowers, vintage pearls and this little pearl thingie I found in my stash. Last, is another jewel box that a friend of mine bought from me (the very top photo). It features a gorgeous and colorful vintage jewelry piece. She wanted some velvet paper added to the inside so I finished it up and added a pretty stamped flower with a Swarovski crystal inside to surprise her (I'm not showing it just in case she reads this before tonight). I always like to add a surprise element to the bottom of the boxes that I create and I don't photograph it for my etsy shop because I want it to be a surprise for the buyer. Just a little extra! 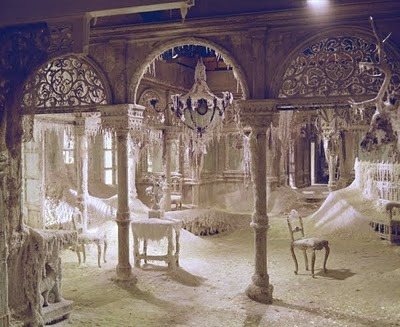 I've always loved the ice palace scene in Dr. Zhivago and always thought it be so cool to re-create those rooms ... all white and ice covered. However, having three boys (four, if you count my husband) and dogs really threw a wrench into that dream. But, I had the opportunity, not too long ago, to actually follow that dream. After visiting a local decorator show house, I thought it would be exciting to design a room myself. I shared this idea with my friend Kristin, another home décor enthusiast, and together we embarked on this challenging, yet exhilarating journey. After we approached the Springhill Center for Family Development with our ideas, we began planning to transform an ordinary conference room (shown on right) into a white winter wonderland. On a limited budget (very limited) and only two weeks to transform the room, we went to work. We painted the ceiling a soft cream and then Jessica, a local designer and friend, applied a Venetian plaster wall technique and cream paint to cover the existing wallpaper. A metallic antique bronze was mixed with a glaze and applied in select spots to highlight the texture. We developed the basic layout and began the hunt for unique and white or off-white furniture. The first thing we needed was a white chaise lounge – a real budget challenge until Ethan Allen loaned us a beautiful, soft cream-colored chaise and pillows to match. 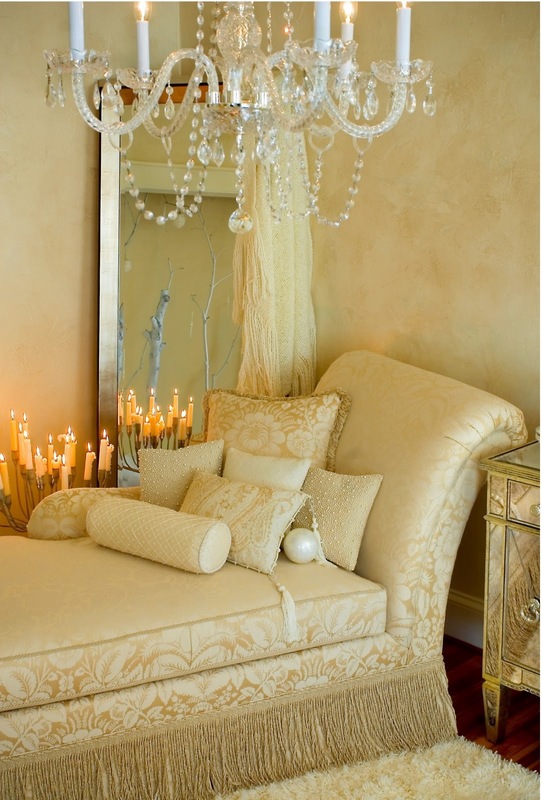 After that, we pieced together the rest, discovering and purchasing delicate side chairs, a gorgeous crystal chandelier, a huge mirror to extend the look of the tiny room, and a soft white shag rug. Remnants of luxurious fabric were layered and sewn together to create majestic window treatments -- a total of only $90!!! To add interest to the ceiling, we purchased, cut and tacked up antique ceiling tins in strategic locations. Continuing the mirrored theme we added Kristin’s glamorous mirrored chest, and then purchased two mirrored wall sconces and a small mirrored table at a local consignment shop. The Before pics: A meeting room at the Springhill Center for Family Development had sky blue ceilings, wallpaper made to resemble stone blocks, and a brightly-painted blue closet (sans doors). The shallow closet without doors gave us the biggest challenge. After measuring, purchasing and cutting wood shelves to fit in the shallow space, we discovered that like most old houses, the walls were uneven and the plaster was almost impossible to work with. Plan B: create an outdoor window scene complete with tree branches, snow and lighting. After scavenging through my neighborhood for the perfect trees (these were all laying by the roadside, so we didn't actually cut them down), we painted them and dusted them with glitter, and then used Christmas tree stands to support them. We added back spotlights, “snow” and icicles to create a majestic winter scene. The resplendent result: A luxurious sitting room, decorated with shades of winter whites, icy silvers and crystals. Don't get me wrong, I wouldn't trade my cluttered, country distressed home full of boys for anything, but it was nice for two weeks. Photo credits: Dr. Zhivago by Ken Danvers, still photographer for David Lean's Dr. Zhivago. via BFI.uk.org and last picture by Vince Lupo Photography. Boxing Day began in England, in the nineteenth century, under Queen Victoria. Boxing Day was a way for the upper class to give gifts of cash, or other goods, to those of the lower classes. This Boxing Day is different ... it’s mine! For some reason, every tag, estate and yard sale I went to had cool boxes! So…I loaded up on them…as you can see. And, here’s what I’ve been doing with them. These are going to be marketed as jewelry or keepsake boxes. The new bigger ones (picture on very top and to the left) are much longer, deeper and roomier and I’m not exactly sure what I’ll do with them after painting and embellishing them. Any ideas? My sister's jewelry show was very successful and I sold four jewelry boxes, too! On Tuesday, as part of winning the Creative Writer Blogger award, I shared 6 things about myself and only one was true. So, which one was true, you ask? 1. After graduating from college, I worked as a fashion intern and then assistant fashion writer at Seventeen Magazine. It was very low paying and I eventually had to leave New York, so I could actually eat. False. I wish it were true. I actually was a fashion copywriter in Philadelphia right after I graduated. Got offered the same job and New York, but turned it down. They offered me $15,000 - I think that might of covered five months rent. 2. My grandparents had a farm in Vermont. Me and my sister would spend the entire summer there and every time we came home, our house was changed. For example, one August we came back to find a new sunporch off of our kitchen. Other summers, we would find our bedrooms completely changed -- new bedspreads, freshly painted walls, etc. It was fun trying to guess what would change while we were away. Totally false; I don't even know anyone who lives in Vermont. 3. I learned to ski when I was only four years old. I skied throughout high school (but we didn't have a team, just a club) and finally realized my dream when I joined my college ski team as a freshman. I quit my sophomore year after I ran into a snow making machine in front of my teammates. False. I learned to ski in high school and didn't actually get good at it until my early 20s. I did run into a snow making machine and actually got stuck there until some kind soul pulled me up (that was in high school).4. When I was working as the senior editor of FTD's Florist Magazine, famous rock musician Bob Seger's wife (Annette Sinclair) wore my wedding dress on the cover of our bridal issue. It was a size two and it was still too big on her so we had to pin it up in the back. Truth. That girl was so tiny that we had to pin the back of the dress and photograph her in a certain way so you couldn't tell (way before Photoshop).5. When I brought home a "grab bag box" from a local flea market, I found a beautiful, but dirt-covered, precious stone brooch. After researching online, I found similar brooches valued at $300. I paid a total of $5 for the entire box of items! I still have it and should probably sell it because I've never worn it. False. A dream.6. I went to college to study journalism, but switched my major halfway through my junior year to fine arts. My parents weren't happy. I ended up graduating with two BA degrees, but was much poorer as a result. I did finally manage to pay off my student loans after I was married. False. I majored in art and fashion for a year and ended up with a degree in journalism. Ladies: Just grab the Creative Writer Blogger graphic from this page and let your creative mind go wild! Write six things about yourself long or short and make ONLY ONE the truth. I know you can do it. Thanks to my pal Cassie at Primitive and Proper, I was recently awarded the Creative Writer Blogger Award. So, I have to write 6 things about myself and you have to guess which one of the 6 is true. Then I get to pass on the award ... watch out, it could be you! Followers not allowed to guess include my family members! Speaking of which, my sister, Stacie, is coming to my house this Thursday to hold her annual handcrafted jewelry show (see example above). If you live in the area, be sure to contact me for directions to my home. If you don't live in Maryland, check out her shop at http://www.etsy.com/shop/staciejewelry. Anyway, a couple days from now, you will find out the real truth and nothing but the truth. Here are my six "truths." 3. I learned to ski when I was only four years old. I skied throughout high school (but we didn't have a team, just a club) and finally realized my dream when I joined my college ski team as a freshman. I quit my sophomore year after I ran into a snow making machine in front of my teammates. 4. When I was working as the senior editor of FTD's Florist Magazine, famous rock musician Bob Seger's wife (Annette Sinclair) wore my wedding dress on the cover of our bridal issue. It was a size two and it was still too big on her so we had to pin it up in the back. 5. When I brought home a "grab bag box" from a local flea market, I found a beautiful, but dirt-covered, precious stone brooch. After researching online, I found similar brooches valued at $300. I paid a total of $5 for the entire box of items! I still have it and should probably sell it because I've never worn it. 6. I went to college to study journalism, but switched my major halfway through my junior year to fine arts. My parents weren't happy. I ended up graduating with two BA degrees, but was much poorer as a result. I did finally manage to pay off my student loans after I was married. So, which one of these is really the truth? Oh, and winner(s) get a prize! This darn table. What started out as a relatively easy project became one of those Murphy's Law things (I have a lot of those). Anyway, about two months ago, I fell in love with this table buried under a mountain of junk at a thrift store. When I saw the price, I knew it was meant to be. It needed some TLC, but not that much. Brought it home and spray painted the legs a flat black and they looked great. The wood top needed to be sanded and re-stained, so I tackled that this weekend, and it came out DARK...way too dark. With the black legs, the whole table lost its original beauty. (See photo, above right). What to do? Instead of re-staining, I thought that I would repaint, so I asked my friend Cassie at Primitive & Proper for some color advice (she's an expert at painting furniture). She gave me some advice and I started collecting paint chips. Then I remembered what my business was all about --using what I have or getting things from tag sales, oops paint sections, etc. So, taking my own advice, I scoured by basement paint shelves and choose Benjamin Moore's Fernwood Green (which, by the way, covers my office walls). I love this paint because it looks different everywhere you use it -- and it always looks good EXCEPT when you can't paint. Yes, the color looked great with the black (well, almost black) wood top, but I screwed up on painting the legs ... another quick email to Cassie. More advice. Repaint. Two days later, I'm done. I love the results, but this project was only supposed to take me about two hours. I love picture frames. I look for interesting ones at every yard sale I attend. I recreate them for myself and for my etsy shop, but when I read Donna's post at Funky Junk Interiors, I realized that a picture frame can mean literally anything that holds a picture or pictures of your loved ones. Take the one above...it's a rusty old gate that my sis gave me a long time ago. It sits in my office and displays generations of my family and my husband's family. Some are even hanging in traditional frames. Of course, I wanted to include a picture of my boys on this "frame," but it looked out of place with all these time-worn, sepia-toned memories. That's when I started experimenting with iPhoto and came up with an "antiqued" photo of my own. My favorite picture of my three loves in sepia! Last, but certainly not least, I want to thank Carmen of Beyond the Fringe, for the sweet (literally) sugar cube scrubs that she sent me along with a wonderful green tea lemongrass soap. Here are the sugar cubes waiting to be used ... don't they look deliciously pretty? I love the new industrial chic look that's been popularized by the likes of Pottery Barn, Crate and Barrel and other iconic trend keepers. I must admit that I've always liked it, but never knew just how to incorporate this look into my home. Industrial gadgets line up in my garage and craft area and sometimes make their way into my collage designs. There's nothing like a rusty gear or that locker room wire mesh that can stir the creative juices. So, I have been experimenting with incorporating this look in my house, which is for the most part durable chic (meaning boy-proof) and part shabby chic. The really cool found objects in these photos embrace that look without being too over the top. I'm really not sure what the round thing with holes in it is (a bobbin? ), but it's really heavy and is quite mechanical looking in nature. The other mesh flower holder doesn't have an industrial background -- it's just a cool spice rack I found at a tag sale -- but I think it provides the look just fine! Another way to incorporate the industrial look into your home is with the large metal numbers I have shown above. I love the way they look and they work really well with any type of decor. So, there you go, trend-setters, set away. Today I went wild with chalkboard paint. Ever since I found out that I can use it on glass, I've been itching to try it. The problem: rain or wind. Although we've had some picture perfect days here in Annapolis, they've always been accompanied by more than a gentle breeze...not good, unless you want a chalkboard car or house. So, when I got up for boot camp (see earlier posts) early this morning, I noticed that the stars were out and there was no wind. Perfect painting weather! Once I got my little guy on the bus, my inner schoolteacher took over and I began taping the areas around the mirror and the cabinet door I planned on chalk painting. The mirror is an ongoing project. I changed it so many times that I don't have the original pictures anymore. It's been sitting in my garage because the actual mirror part is in bad shape, so once I found out that I could paint it with chalk, it came out of hiding again. So, anyway, I started taping it, however, since there was rope around the mirror (I was going for a nautical look), the tape wouldn't hold. Then, I got this brainstorm -- aluminum foil! It's flexible so I could form it around the rope. Then I used a butter knife to "tuck it in." Worked like a charm! Here are the results -- sorry abut the pictures, but it was getting dark by the time I finished. I went a little crazy and began painting other things, too. The dog is now completely erasable. Drove up to Massachusetts to see my son for parent's weekend, but the drive (as you may have guessed by now) was killer. Hit stop and go traffic in Connecticut and Mass and our 8 hour trip took almost 12 hours. Had a fantastic weekend with my two older sons only to turn around and drive back last night for another 12 hours...ugh. On a more pleasant note, I did manage to hit two tag sales and an antique shop tent sale while the teens were sleeping in and the pics above show the lovely selection of goodies I bought. I absolutely love the antique frame and picture I stole for $10 at the antique shop. It's going above my piano. Of course, I will have to do some minor repair work on the frame and paint it, but I just can't wait to replace my TJ Maxx faux stone trivets that bedeck the walls now. And how about that cool scale! It still works and has just the right amount of rust to make it super chic. At my sister's house, we worked and played hard all day. 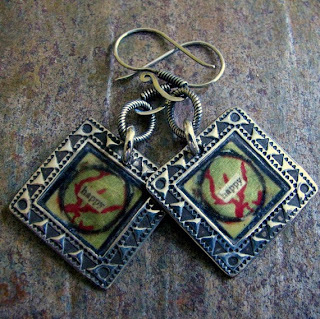 She created her amazing jewelry and I worked on many things including light switch covers and trinket boxes. Since I've transformed almost every light switch cover in my own home, I've decided to branch out. Actually, I scored about 12 covers at a yard sale this summer and they've been staring blankly back at me for way too long. I decided to test some collage techniques on these little blank canvases. First, I created a textured surface with acrylics and gel medium on each switch plate. I let it dry a bit and then used a pencil to draw little designs and write some words. After it dried over night, I painted two of them with a pink and white wash and I decoupaged a black and white napkin over the other. Then I took them all to my sister's to add the finishing touches. I liked the textures on one of the pink covers so all I did with that one was spray it with lavender glitter mist (thanks Stacie) and glue on some of those pretty Prima flowers. The other, I decided to stamp (i wrote the word dance on the switch plate .. it's very subtle) with a ballet outfit. Adding Swarovski crystals gave new meaning to the term, "twinkle toes." The black and white one needed some help so I stamped it with some flowers using black ink and then glued on some more of those fab Prima flowers. Little white and black earring pieces fill the centers. If you can't tell by now, I'm in love with Prima fabric flowers. I always pined over them at my local craft store, but couldn't decide what jar to get and getting all of them was a little over my craft budget. But guess what? Yep, I bought five bottles of flowers at that super duper craft yard sale I went to last weekend and I can't stop using them ...as evident in both of these sweet little trinket boxes I competed yesterday. To make them, I am using large buttons and button earrings as a base and then, artfully arranging vintage jewelry pieces and even whole earrings on them. Many of the pieces I am using have seen better days so I do have to replace stones (thank goodness for my vintage rhinestone collection). Well, I'm off to my sister's house tomorrow. 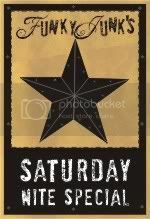 We are going to spend the day crafting. She'll be making jewelry and I'll be making jewelry boxes...hey, maybe we have something there! After my photo shoot, I spent the rest of the day organizing and reorganizing. Since our basement flooded, my husband worked hard cleaning out the unfinished storage area where most of the water had settled. I went upstairs to my closet craft room and my makeshift craft room (my college son's room) and started to put away all my new purchases from yesterday's yard sale. That's when I really started cleaning. Right now, I'm taking a break and it's not even near finished...I've made an even bigger mess (see above). Paper is strewn everywhere and it's a real pain because I'll start a project in my son's room and then remember that I left something in the closet craft room. Well, this is only temporary until after the craft show and then I'll move back into my little closet space. Better get back to work!